This is what Steve says about Harold and the Witnessofthetruth. As you all know NOTHING happened. Both Harold Camping of family radio & Witnessofthetruth have been proven to be false teachers on my channel for a long time, but now we know 100% that they are both false teachers & false prophets. I tried to warn them & their followers but NO ONE listened to the truth. More & more we see that the false teaching brings about the message that Satan wants everyone to listen & obey... Satan comes to steal, kill & destroy. Its so sad but I am glad the truth has shown 100% that Harold Camping & Witnessofthetruth are false teachers & false prophets. I turn them over to Satan & let the Lord rebuke them because they both ignored hundreds & thousands of corrections & warnings. The deaths of who killed themselves will be on their heads. Pray that God will rescue the lost & deceived. Now, this is what Steve had said. In the video he makes some good quotes of the Bible and he do do some preaching. His video is long and drag out. But I guess its because he is trying to get his point out there of how he thinks the world will end. Oh yeah, he does say that, "He will come like a thief in the night" in the video. Yesterday, Harold Camping a preacher had predicted that it was judgement day and the world would end. He said that there would be earthquakes and so on. Well it turns out that in Iceland an eruption had begun at the Grimsvotn volcano and with a series of small earthquakes. The smoke could be seen almost seven miles away from the volcano. Iceland has the most volcanic activity in the world. But, rarely causes any deaths. Grimsvotn has also had eruptions in 2004, 1998, 1996 and 1993. So, Harold did have a little bit of a prediction of some earthquakes. They just didn't end the world as he thought they would. 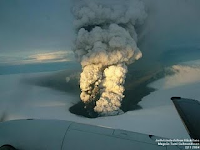 Below the Grimsvotn volcano video shows how many earthquakes there was on May 21, 2011 at 7:34 am eastern time. Now, the other thing is how this guy in the video is telling us of future earthquakes and not to be scared, but to be ready. In this video directly below is an airplane shot of the large eruption in Iceland yesterday afternoon. It shows Grimsvotn projecting a very large plume of ash high into the atmosphere. "Is this the beginning of the end of the world?" Warning! This video is very graphic! Get ready for Jesus' Second Coming which is sooner than you think! The Bible says He will come like a thief in the night. The signs and warnings are all around us - don't be caught off guard. Live for Him and Him alone. Jesus first expressed this idea that He would return “like a thief in the night” in the Olivet Discourse. Four of His disciples came to Him on the Mount of Olives and asked, “what will be the sign of your coming and of the end of the age?" (Matthew 24:3). During His response Jesus described the signs that will take place before His return, providing a way for us to determine the general time of His return. Repeatedly, Jesus told of the increasing deception that will come in the Last Days. He commanded us to watch and stay alert so we would not be deceived and get caught off guard. Therefore keep watch, because you do not know on what day your Lord will come. But understand this: If the owner of the house had known at what time of night the thief was coming, he would have kept watch and would not have let his house be broken into. 44 So you also must be ready, because the Son of Man will come at an hour when you do not expect him (Matthew 24:42-44). But understand this: If the owner of the house had known at what hour the thief was coming, he would not have let his house be broken into. 40 You also must be ready, because the Son of Man will come at an hour when you do not expect him (Luke 12:39-40). Paul, wrote that, “the day of the Lord will come like a thief in the night” when reminding the Thessalonians of his previous instructions to them about the Second Coming. Here is what Paul wrote. Now, brothers, about times and dates we do not need to write to you, for you know very well that the day of the Lord will come like a thief in the night. While people are saying, "Peace and safety," destruction will come on them suddenly, as labor pains on a pregnant woman, and they will not escape. But you, brothers, are not in darkness so that this day should surprise you like a thief. You are all sons of the light and sons of the day. We do not belong to the night or to the darkness (1 Thessalonians 5:1-5). When Paul says, “the day of the Lord will come like a thief in the night,” notice that he is referring to “people,” “them,” and “they,” Paul is making a distinction between the believers and the unbelievers. Consider what Paul says to the believers in verse four - “But you, brothers, are not in darkness so that this day should surprise you like a thief.” He is telling them that the Day of the Lord will not surprise the believers, because they know what will happen first. On the other hand, Christ’s return on the Day of the Lord will surprise the unbelieving world. Again, in Revelation, Jesus reminds and warns His followers that if they do not stay awake, His return will surprise them like a thief.. Remember, therefore, what you have received and heard; obey it, and repent. But if you do not wake up, I will come like a thief, and you will not know at what time I will come to you (Revelation 3:3). Believers will be aware of the general time of Christ’s return but unbelievers will be caught off guard when Jesus Christ returns to earth “like a thief in the night.” Therefore, don’t let anyone deceive you in any way, many signs will occur before Jesus Christ returns to gather up His Church. If the coming of the Lord catches you by surprise, you will be treated as an unbeliever. Therefore keep watch, because you do not know the day or the hour (Matthew 25:13). If it is, then I am not ready to meet our maker. May 21st 2011 is just 3 days away. I read this first paragraph on 'The Journel of Idiocracy' and look at the video and said, "Can it be"? I guess we just have to waite and see if it will be the end of the world. Oh this is the paragraph I had read. You can go to the site and read the rest. It is something to think about. Mark your calendars everyone! 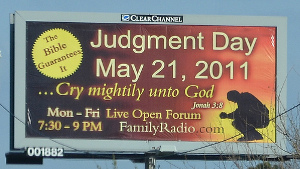 Harold Camping, president of Family Radio, has predicted the rapture of Christians will begin on May 21, 2011 at 6:00 PM (time zone unclear*). The world itself, and the remaining sinners, will remain until October 21, 2011, at which point God will destroy everything. I’m sorry to disappoint those of you who believe the Mayan calendar calls for the end of the world sometime in 2012 – you’re obviously wrong. Do you think that this Saturday is Judgement Day? Designed in 1997, a computer program called "Webot" tapped the internet for clues predicting the recent global economic collapse. Ok, now this is scary that a computer can predict what is happing to the world. You have to see what this machine has predicted. Have you heard of this computer "The Webot"? I didn't until now and why have it been kept under raps? The Great Pyramid's precise design has led experts to believe it foretold events throughout history, including the September 11th attacks. This is scary that these two guys figured out that this Pyramid has prohecies told on it's walls and that one of them is about December 21, 2012 being the end of the world. The Last Supper is Leonardo Da Vinci's most famous work, but he also sketched prophetic symbols of calamitous disasters. These vision of Leonardo Da Vinci are coming to past as well as Nostradamus. These two are the most famouse of the prophets and their visions are coming to past. It's a shame that this world will end. Is there no hope for us? Ancient texts are said to divulge what the end of days will entail. Do you believe that we are in the lasts days that will be the end of the world? I do and it's a scary thing that I wished that I didn't believe in.